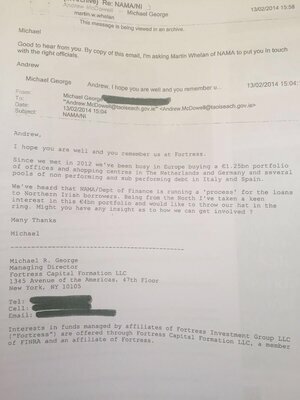 US investment fund Fortress was the only underbidder in Nama’s eventual sale of Northern Ireland loan portfolio, otherwise known as Project Eagle, to Cerberus. Nama approved a proposal to sell Project Eagle at a minimum price of £1.3bn over two meetings on December 12, 2013 and January 8, 2014. On January 8, 2014, Lazard and Company Ltd were appointed as the loan sale advisor for Project Eagle. 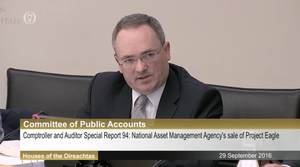 On February 13, 2014, it was reported in the press that Pimco had approached Nama, back in 2013, to buy the whole Northern Ireland portfolio and, a day later, selected bidders were allowed to access information on the loans in a data room. 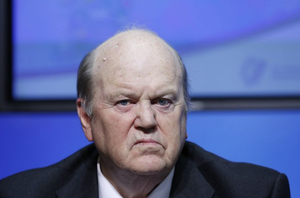 On March 12, 2014, Pimco withdrew from the loan sale process – after informing Nama of a £15million success fee arrangement involving a member of Nama’s Northern Ireland Advisory Committee, Frank Cushnahan, London law firm Brown Rudnick and Belfast-based Tughans solicitors. 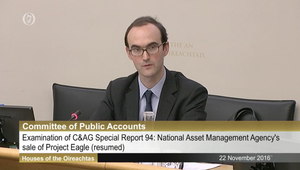 On April 3, 2014, Nama approved the sale of Project Eagle to Cerberus who also used the services of Brown Rudnick and Tughans solicitors. You may also recall reports that Fortresss had to make a representation to the Department of the Taoiseach on February 13, 2014, before it was invited into the bidding process some five weeks after it had begun and Nama’s denial of the same. 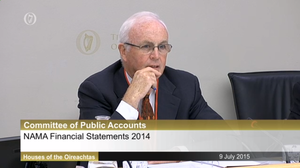 During yesterday’s PAC meeting, Fine Gael TD Noel Rock had the following exchange with Brendan McDonagh. 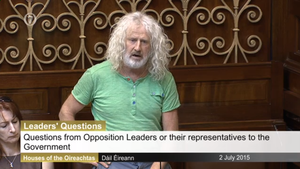 Posted in Misc and tagged email, Fortress, Mick Wallace, Nama, Noel Rock, PAC, Project Eagle at 12:18 pm on September 30, 2016 by Broadsheet. Probably because a hell of a lot of winking and nudging appears to have taken place – maybe it’s infectious? Would you buy a used car, or anything, from the gentleman appearing in that photo? The only person I’d buy a used car from is Swiss Tony. Now there’s a man who knows how to entertain ‘a beautiful woman’! Perhaps Michael George heard about Project Eagle on the 13th February and contacted both McDonagh and McDowell at the same time. Shhhh. Go away with your sensible views. Will you go on out of that…. He is a man. He cannot possibly multi-task like that! Guilty feet have got no rhythm, I’d say.